**update** This article was written by Maria Jacketti, Ph.D., for conservastore.com and GreenTopics blog. originally posted on April 2014. 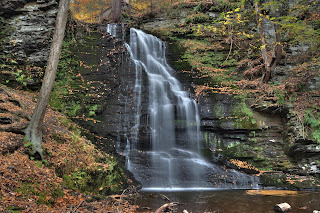 I live in the Pocono Northeast, where it has been raining all day. So, what else is new? Several seasons ago, it rained all but a handful of days during the entire month of June. This sogginess topped off an almost equally rainy May. 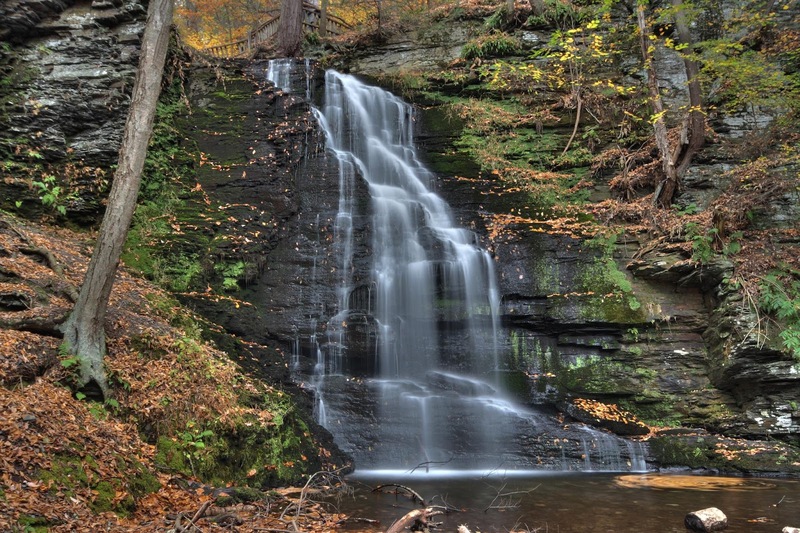 Some might say, we are spoiled, since our region abounds with water, so much so that our flooding of the Susquehanna River has provided legendary destruction. While most of may take water’s abundance for granted, only a fool would not acknowledge its power. Our modern deserts once were once oases, and/or absolute seas. This fact should jolt us into a new kind of water reality. Abundant water can dry up, and often very quickly. Population here, and around the world continues to burgeon. While historically, we used to measure this growth by the millions, it is now all about the billions of new bodies and souls incarnating on this planet. And they are all very thirsty! The world as we know it looks to a future of drought and water shortages. This is the story of much of America today – we water lords of the Northeast are really the exceptions to this trend – for now. Those of us who can see how water is becoming an ever rarer resource would do well to conserve at this moment, rather than weep later. For afterthought tears will surely not prove enough to quench our thirst. Today there are many easy ways to conserve water in our homes. Most involve the installation of devices such as aerators, water efficient shower heads, and bladder-type devices that can we placed in toilet tanks to conserve with each flush. All of these form part of my home water conservation network today. Once they are installed, you need not think much about them, knowing that their simple ingenuity will work for years, preventing waste, and assuring that a drop of water saved is a drop earned. 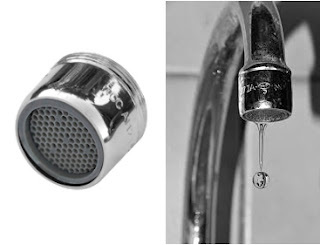 Easily installed faucet aerators conserve water, while shaping the stream uniformly and reducing splashing. Water is delivered in softer, almost ticklish mini jets, rather than a standard gush. The stream definitely looks more modern and intelligent. Aerators are inexpensive and add next- to- no- work in the quest of making one’s house more water efficient. The same can be said about the new generation of water-saving showerheads, which offer various flow-settings, making for lovely massage-effect cleansing experience. 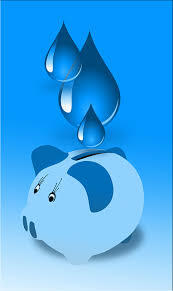 Some consumers report saving as much as a hundred dollars a year on their water bills, simply by making this change. And what could possibly stand in our way? 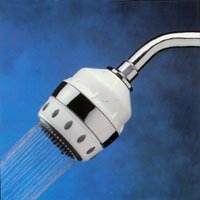 These new showerheads usually cost less than twenty dollars and install in minutes. If we say we can’t install these convenient devices, maybe we just need to consider our laziness quotient, and then grab an energy drink, and forge ahead with this worthy activity. Making a large house like mine more water efficient took less than an hour! 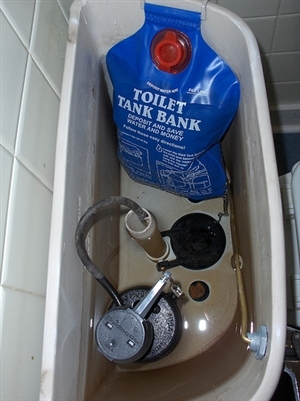 Finally, installing a toilet tank bank in your units can make a lot of sense, particularly if your tanks are from the 1980s or earlier. (This is the case in my home, which was built in the 1970s.) Before installing one, use a flow measurer to calculate current water levels. This will help you construct a before/after picture of toilet water usage. The installation of aerators, water efficient shower heads, and toilet tank banks, will perhaps not make you rich overnight in nickels and dimes. On the other hand, after a year, you will begin seeing the difference. Moreover, you will be setting a great example for your family, neighbors, and country. Imagine if the use of these products were commonplace? Yearly water savings might start to ease the great American drought and green up some patches of desert. As we know as of Today, August of 2015, California is facing a severe drought and was declared in state of emergency. Water saving devices can be very helpful in cutting water consumption. Every count drops after all. Every drop counts! visit us at Conservastore.com. where you can find great variety of Water saving products and solutions. Saving water doesn't have to be a difficult task with water saving products such as aerators, low flow shower heads, toilet banks and other accessories you can save water just by installing those devices. 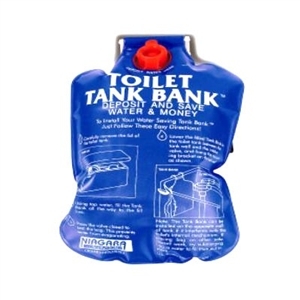 in Conservastore we also have our water saving Sav-eco kits.